Hello ... Hello ... my old friends ... It's great to see you once again! 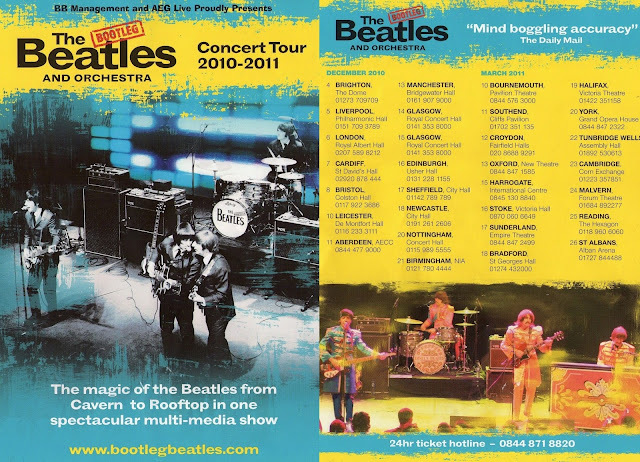 It really does seems like "Yesterday" since Yours Truly KJS picked up the above flyer for The Bootleg Beatles at the fantastic ELO Experience gig in Stoke-on-Trent last Sunday 14th November [see my review here]. This established Beatles tribute act are well worth going to see/hear and an ELOBF endorsement. ELO Beatles Forever [ELOBF] recommends The Bootleg Beatles to those enlightened folks who enjoy the music of ELO, Jeff Lynne, The Move, Roy Wood, The Idle Race, 'Brum Beat', The Beatles [of course!] and related artistes.